Though Skitch has apparently been around for a while now I didn’t hear about it until I saw a Merlin Mann’s video on how he has his Mac desktop set up. For those that don’t follow Merlin’s stuff you really should. Since I tend to write about software that I find for my Mac quite a bit I drop in a lot of screen shots. Since Macs have an excellent built in screen capture capability I often just used that, pushing Command-Shift-4 to activate it and drop the resulting capture as a PNG on my desktop. I would then take the PNG and load it up into my graphics editor (usually GIMP), then crop or edit the image. If I wanted to annotate the image with highlights or callouts I would use the line drawing tools which were a bit of a challenge. This is where Skitch really shines. You can capture an image just as easily as with the built in Mac capture tools but this give you an editable surface that allows you to quickly crop, resize and annotate the image with really simple tools. 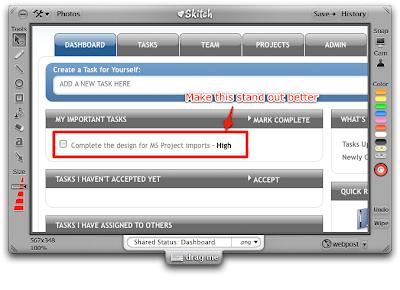 Skitch Video Review from Michael Warf on Vimeo. On top of all this Skitch is free. If you know of a better solution for screen capture than what I’m getting with Skitch please drop a note in the comments below.